Photo: World’s Tallest Statue, the ‘Statue of Unity,’ at Kevadiya, Narmada District, Gujarat, India. 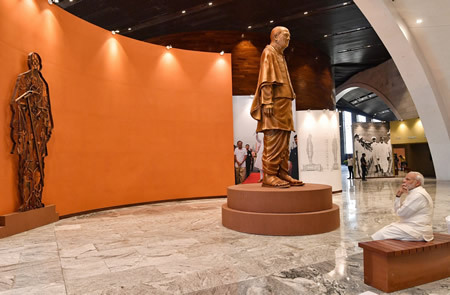 Photo: Prime Minister Narendra Modi visiting the Museum, Exhibition and the Viewers’ Gallery, during the dedication ceremony of the ‘Statue of Unity’ to the Nation, at Kevadiya, in Narmada District of Gujarat on October 31, 2018. 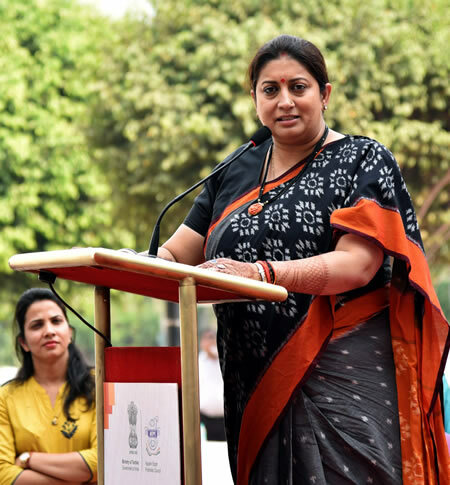 Photo: India’s Minister for Textiles, Smriti Irani, addressing the gathering at the flag off of Unity March and the unveiling of “Fabric of Unity” in Gurugram, Haryana, on October 31, 2018. New Delhi, October 31, 2018 — Prime Minister Narendra Modi today dedicated the world’s tallest statue, the ‘Statue of Unity,’ to the nation. 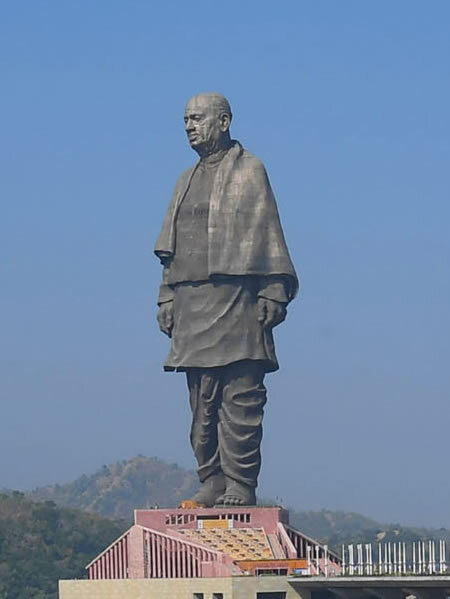 The 182-meter statue of Sardar Vallabhbhai Patel was dedicated to the nation on his birth anniversary, at Kevadiya in Narmada District of Gujarat. Greeting the people of India on this occasion, the Prime Minister said that the entire country is celebrating Rashtriya Ekta Divas today. He said the integration of India by Sardar Patel has resulted in India’s march towards becoming a significant economic and strategic power. He spoke of Sardar Patel’s vision of a strong and inclusive India and the collective responsibility of its people to maintain the unity and integrity of the nation. 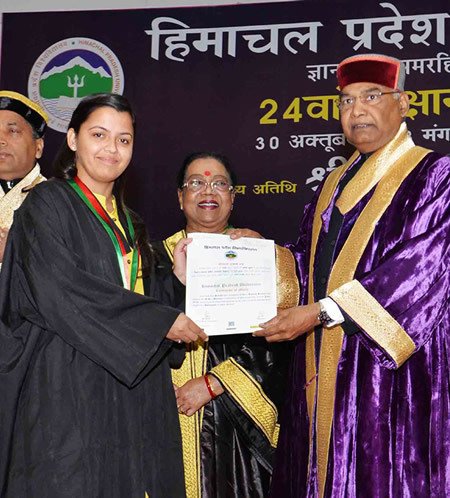 Photo: The President of India, Ram Nath Kovind, presenting the degree to a student at the 24th Convocation of Himachal Pradesh University, at Shimla, in Himachal Pradesh, India, on October 30, 2018. Source: President’s Secretariat, New Delhi. 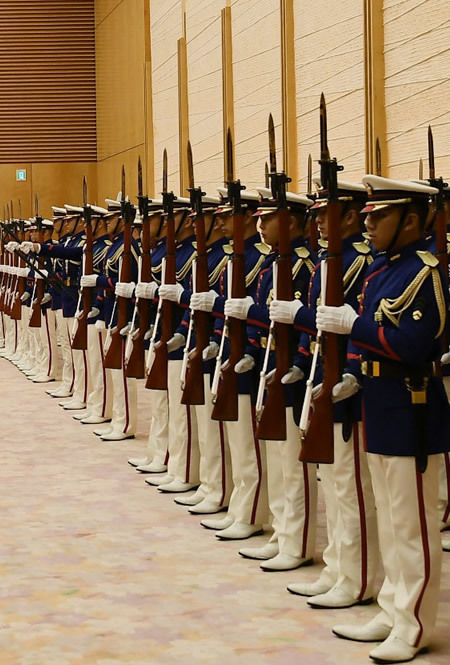 Photo: Japanese soldiers get ready to present the Guard of Honour to Prime Minister Narendra Modi of India during the ceremonial welcome in Tokyo, Japan, on October 29, 2018. Photo: Prime Minister of India, Narendra Modi, being received by the Prime Minister of Japan, Shinzo Abe, during the welcome ceremony, in Tokyo, Japan, on October 29, 2018. Prime Minister of India, Narendra Modi, visited Japan on October 28-29, 2018 for the India-Japan Annual Summit with Prime Minister of Japan, Shinzo Abe. 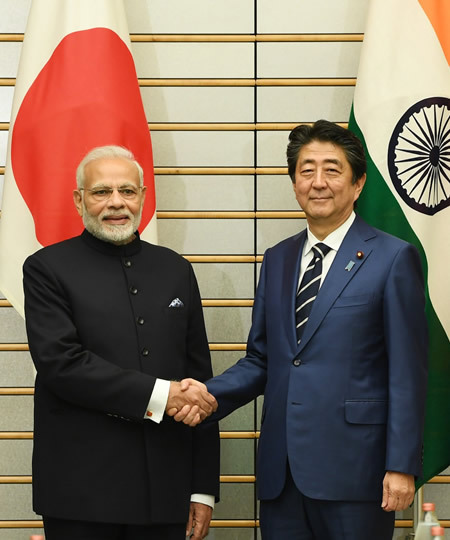 Prime Minister Modi and Prime Minister Abe reviewed the significant milestones achieved over the last four years and outlined the shared vision for the future of India-Japan relations. India and Japan had been sharing the universal values of freedom, humanism, democracy, tolerance, and non-violence throughout a long history of academic, spiritual and scholarly exchanges, their joint statement declared. Source: Prime Minister’s Office, New Delhi. 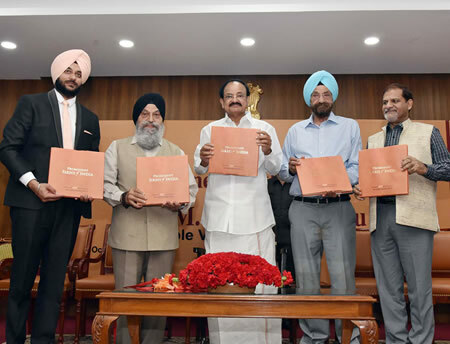 Photo: Vice President of India, M. Venkaiah Naidu, releasing the book ‘Prominent Sikhs of India,’ authored by Dr. Prabhleen Singh and published by Panjab University Chandigarh, in New Delhi on October 29, 2018. On the extreme right is Panjab University Vice-Chancellor, Prof. Raj Kumar. New Delhi, October 29, 2018 — The Vice President of India, M. Venkaiah Naidu, has said that he salutes the valor, commitment and contribution of Sikhs to the humanity especially in the turbulent contemporary times of mistrust, prejudice and intolerance. He was addressing the gathering after releasing the book ‘Prominent Sikhs of India,’ authored by Dr. Prabhleen Singh and published by Panjab University Chandigarh, here today. More than 100 distinguished Sikhs were present on occasion. The Vice President said that the Book highlights the achievements of 50 living Sikh legends from various walks of life and it is a fitting tribute to the founder of Sikhism Shri Guru Nanak Dev Ji. The Vice President said that Guru Nanak Ji had made an immense contribution to this great nation with his commitment to serve the poorest of the poor, irrespective of caste creed and religion. He had laid the foundation to build a society whose primary duty lies in helping the people and participating in nation-building, he said. Sikhs have always shielded the nation whenever the need arose, he added. The Vice President said that the youth must draw inspiration from the life and stories of great leaders who have made their mark. It is our essential duty to motivate the child to stay put in the nation and contribute to development, he added. “I am happy that a young doctor, Prabhleen Singh, has put in much efforts to bring out the stories of valor, service and hard work of 50 great living Sikhs. “I am sure this book will inspire and instill confidence in youth and encourage them to take the lead in scripting the country’s growth story. “My compliments once again to Dr. Prabhleen Singh, and the publisher — Panjab University, Chandigarh — for bringing out the stories of great men and women!” Mr. Naidu said. Source: Vice President’s Secretariat, New Delhi. 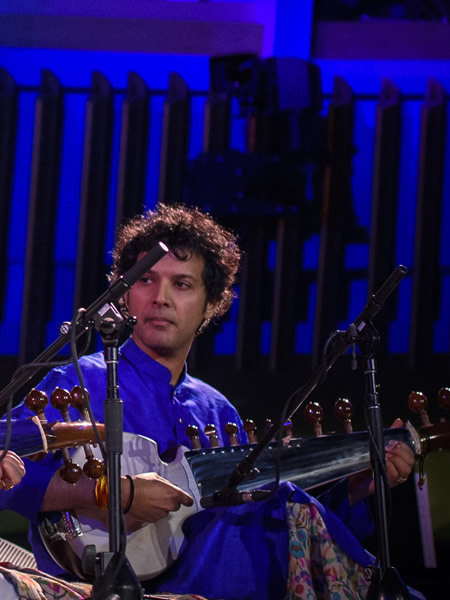 Photo: Ayaan Ali Khan Bangash performs along with his father Sarod Maestro Amjad Ali Khan (not in the picture) at the 2018 UN Day Concert, the theme of which was “Traditions of Peace and Non-violence.” 24 October 2018. United Nations, New York. UN Photo/Loey Felipe. 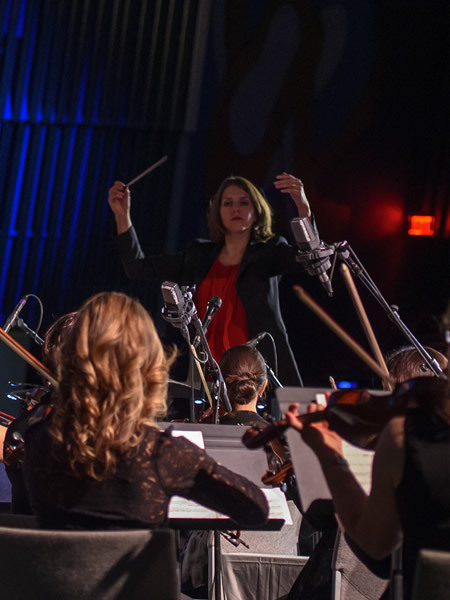 Photo: Lidiya Yanskovskaya, conducts the Refugee Orchestra during the 2018 UN Day Concert, the theme of which was “Traditions of Peace and Non-violence.” The concert featured music by Sarod Maestro Amjad Ali Khan and the Refugee Orchestra Project. 24 October 2018. United Nations, New York. UN Photo/Loey Felipe. 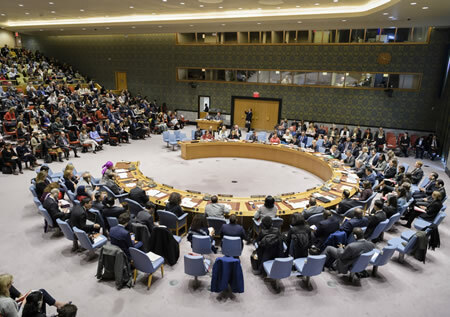 Photo: Wide view of the Security Council meeting on women and peace and security, with a focus on promoting the implementation of the women and peace and security agenda and sustaining peace through women’s political and economic empowerment. 25 October 2018. United Nations, New York. UN Photo/Manuel Elias. 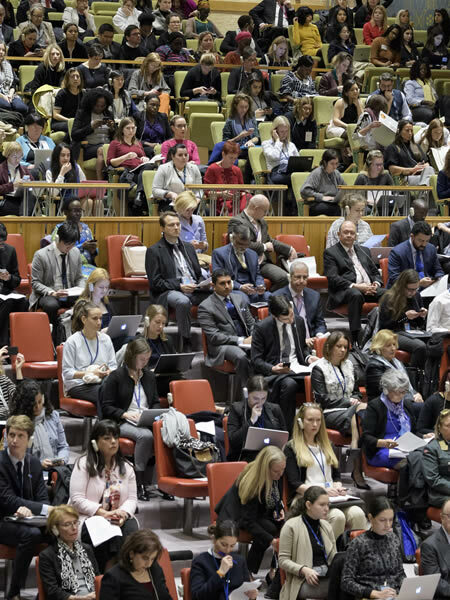 Photo: A view of the observer’s gallery in the Security Council Chamber during the meeting on women and peace and security, with a focus on promoting the implementation of the women and peace and security agenda and sustaining peace through women’s political and economic empowerment. 25 October 2018. United Nations, New York. UN Photo/Manuel Elias. 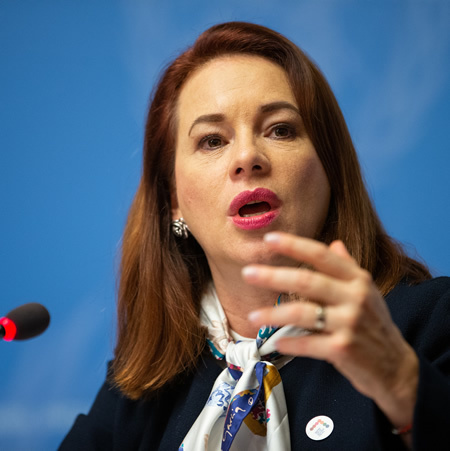 Photo: María Fernanda Espinosa, President of the UN General Assembly, speaks during a press conference about making the UN relevant for all and strengthening multilateralism. Geneva, Switzerland. October 23, 2018. UN Photo/Pierre Albouy. Source: United Nations, New York/Geneva. Photos: Latest Sporty and Elegant Watches from IWC Schaffhausen. London, October 24, 2018 — QS Quacquarelli Symonds has released the rankings of Asia’s 500 best universities. The National University of Singapore takes back the leadership of the Asia ranking from Nanyang Technological University, and the University of Hong Kong moves three places to second. However, it is Mainland China’s universities that have made the most significant impact with five in the top 20 - two more than last year - all improving their position. Japan is the second most represented country, followed by India and South Korea. Led by Indian Institute of Technology Bombay (IIT Bombay), India has eight universities among the top 100 universities in Asia. IIT Bombay is ranked 33 followed by IIT Delhi (40), IIT Madras (48) and Indian Institute of Science Bangalore (50). It's heartening to know that @iitbombay, @iitdelhi, @iiscbangalore & @iitkharagpur have improved on their rankings from last yr in latest #QS Asia Rankings. New Delhi, October 24, 2018 — The Seoul Peace Prize Committee has decided to confer the 2018 Seoul Peace Prize on Prime Minister Narendra Modi of India. It has been done in recognition of his dedication to improving international cooperation, raising global economic growth, and accelerating the Human Development of the people of India. While awarding the 2018 Seoul Peace Prize, the Award Committee recognized Prime Minister Modi’s contributions to the growth of the Indian and global economies. The Committee lauded PM’s initiatives to make the government cleaner through anti-corruption measures and demonetization. 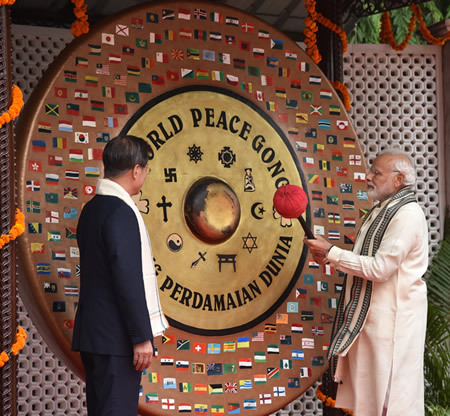 The Committee also credited Prime Minister for his contribution towards regional and global peace through a proactive foreign policy with countries around the world under the ‘Modi Doctrine’ and the ‘Act East Policy.’ Prime Minister Modi is the fourteenth recipient of this award. Expressing his gratitude for the prestigious honor and in light of India’s deepening partnership with the Republic of Korea, Prime Minister Modi has accepted the award. The Seoul Peace Prize Foundation will present the award at a mutually convenient time. The Seoul Peace Prize was established in 1990 to commemorate the success of the 24th Olympic Games held in Seoul, Republic of Korea - an event in which 160 nations from across the world took part, creating harmony and friendship and a worldwide atmosphere of peace and reconciliation. The Seoul Peace Prize was established to crystallize the Korean people’s yearning for peace on the Korean Peninsula and in the rest of the world. The Seoul Peace Prize has been awarded biennially to those individuals who have made their mark through contributions to the harmony of humankind, reconciliation between nations and to world peace. Past laureates include distinguished global personalities like former UN Secretary General Kofi Annan, German Chancellor Angela Merkel, and renowned international relief organizations like Doctors Without Borders and Oxfam. After assessing over a hundred candidates proposed by over 1300 nominators from around the world, the Award Committee decided to bestow the Prize on Prime Minister Modi, calling him ‘the perfect candidate for the 2018 Seoul Peace Prize. Photo: Vice President of India, M. Venkaiah Naidu, addresses the 13th convocation of Jamia Hamdard University, in New Delhi on October 23, 2018. New Delhi, October 23, 2018 — The Vice President of India, M. Venkaiah Naidu, has said that girls’ education should be the center of women empowerment. Addressing the 13th convocation of Jamia Hamdard University, here today, he stressed the need to empower students, especially girls by providing skills, apart from academic excellence to compete in the global job market. The Vice President appreciated the efforts of Jamia Hamdard Management and faculty for having almost 50% enrolment of female students in its Hamdard programs and said that educating girls of all sections of society is a vital factor in the overall development of the nation. There is nothing more important than educating women - it is the one sure shot, a consistent gauge of progress for practically every development indicator, from mortality declines to economic growth, democracy, and justice, he said. “Jamia Hamdard currently houses one of the pioneering colleges in the field of Nursing Education. I understand that there is a fierce competition happening to obtain a seat in the prestigious Rufaida College of Nursing at Jamia Hamdard. I appreciate that graduates and teachers of the Nursing College of Jamia Hamdard have won global recognition for their committed service,” Mr. Naidu stated. Mr. Naidu told the students in the medical profession not to let technology and gadgets overtake people and relationships. “Always respond sensibly, sensitively, reservedly and mildly to people who come to you suffering from ailments of the mind, body, and spirit. Always be kind, for there is no virtue like kindness,” he advised. 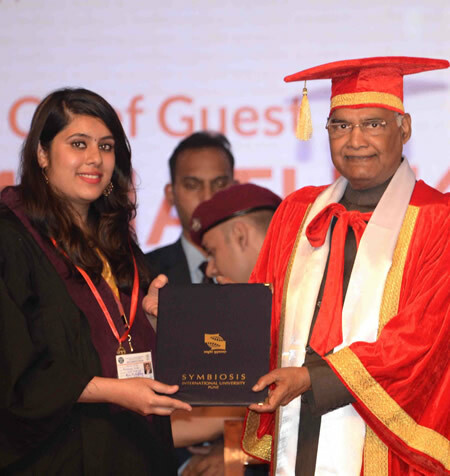 Photo: The President of India, Ram Nath Kovind, presenting the degrees to the students, at the 15th Convocation of the Symbiosis International University, at Pune, in Maharashtra on October 23, 2018. The President of India, Ram Nath Kovind, graced and addressed the 15th convocation of the Symbiosis International University in Pune, today, October 23, 2018. The President said that India had been a center of learning for centuries. From Taxila to Nalanda, the subcontinent’s age-old universities attracted students from different parts of Asia and beyond. In modern times as well our campuses have been open to and welcoming of talented young people from many countries, especially those in our neighborhood and Africa. 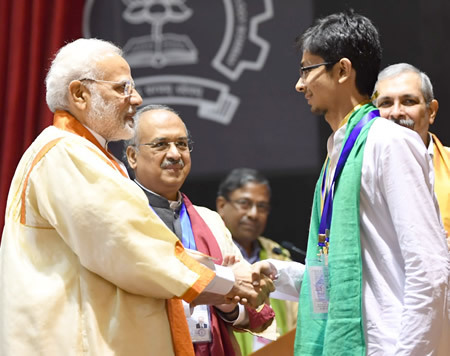 The President said that it is worth noting that 46,144 international students from 166 countries study in various colleges, universities, and institutions of higher learning in India. Symbiosis plays a significant role in this process. He was happy to note that over 1,000 international students study in Symbiosis. Of those who are graduating today, 329 students are from 33 countries other than India. He said that this adds to the multicultural and cosmopolitan atmosphere of Symbiosis’s campus, and promotes goodwill among nations. 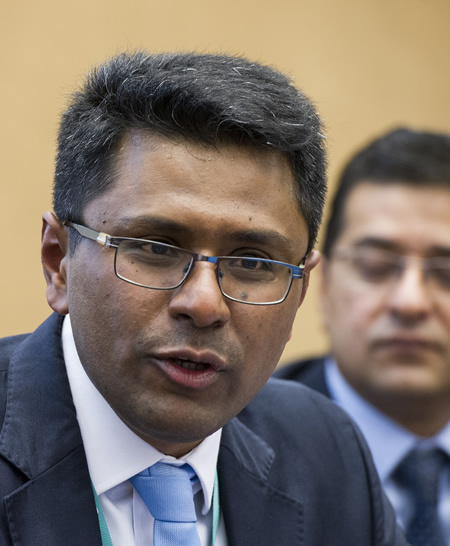 Photo: Dushyant Thakor, Vice President, Invest India, at the Investment Promotion Workshop, World Investment Forum 2018, Palais des Nations, Geneva, Switzerland. 22 October 2018. UNCTAD photo by Violaine Martin. Geneva,22 October 2018 - Agencies from Bahrain, India, Lesotho, and South Africa have won top honors at the United Nations Investment Promotion Awards for excellence in boosting investment into sectors that will have social and economic benefits and help countries meet the Sustainable Development Goals (SDGs). The awards, organized by UNCTAD, honor investment promotion agencies (IPAs) and their governments for their achievements, but also showcase best practices in attracting investment into SDG-related projects that can inspire investment promotion practitioners in developing and developed countries. 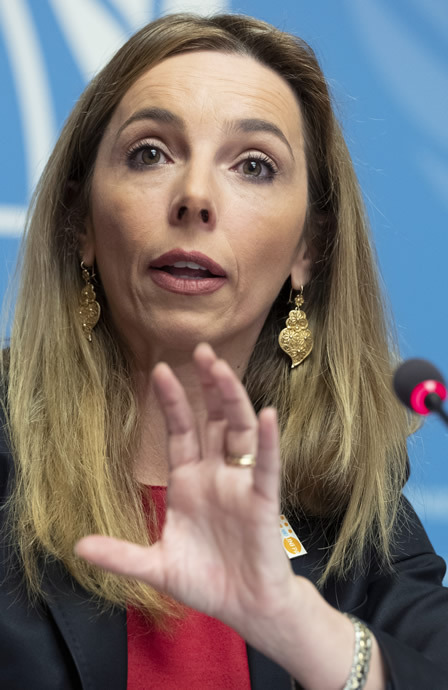 The awards were presented at a high-profile ceremony in the Assembly Hall of the Palais des Nations, Geneva, Switzerland, immediately after the grand opening of the World Investment Forum. What the judges said: UNCTAD gave the award to EDB Bahrain for its role in attracting a large-scale regional data center, which will provide cloud computing services in Bahrain and neighboring countries. The investor plans to employ 10,000 data-solution architects and will support the advancement of technology education in Bahrain and other countries in the Middle East. Mokgweetsi E.K. Masisi, President of the Republic of Botswana, presented the award. What the judges said: Invest India received the award for excellence in servicing and supporting a major global wind turbines company in the establishment of a blade manufacturing plant in India while committing to train local staff and produce 1 gigawatt of renewable energy. Implementation of the project is expected to reduce India’s wind energy cost significantly. Armen Sarkissian, President of the Republic of Armenia, presented the award. What the judges said: LNDC received the award for a large horticulture investment project that will create 15,000 direct and indirect jobs. Khaltmaagiin Battulga, President of Mongolia, presented the award. What the judges said: UNCTAD gave the award to InvestSA for its instrumental role in facilitating two pioneering waste-to-nutrient recycling projects to up-cycle organic waste into natural, sustainable high-protein animal feed. Each project will offer much-needed jobs in local communities and is expected to save an annual 80,000 metric tons of carbon dioxide emissions by diverting organic waste from landfill. 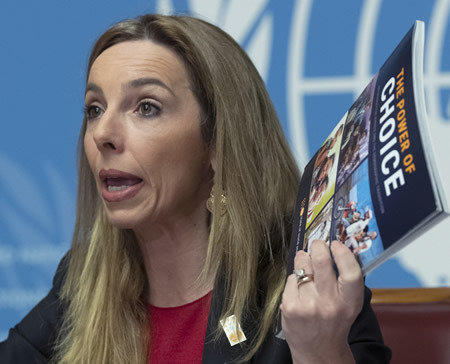 María Fernanda Espinosa Garcés, president of the 73rd session of the United Nations General Assembly, presented the award. • Invest Pacific, Colombia, received a Special Recognition for Promoting Investment for targeting and attracting a seed nursery project by a Peruvian company in a region affected by armed conflict. The project consolidated peace kick-started sustainable economic development in the area and generated 120 direct jobs - 70% of which have been filled by women. Astrid, Princess of Belgium, presented the award. • Tatarstan Investment Development Agency (TIDA) from the Russian Federation received a Special Recognition for Promoting Investment for its role in targeting and securing American investment in an advanced radiotherapy medical center through a public-private partnership. The center makes the latest oncological treatments locally available to thousands of people who otherwise had to travel long distances for treatment. Hage Geingob, President of the Republic of Namibia, presented the award. The IPA Awards have been given annually since 2002 as part of UNCTAD’s investment promotion and facilitation programme. Winners in 2017 were COFIDES of Spain, the Ethiopian Investment Commission and the Board of Investment of Mauritius. Phagwara, Punjab, India. 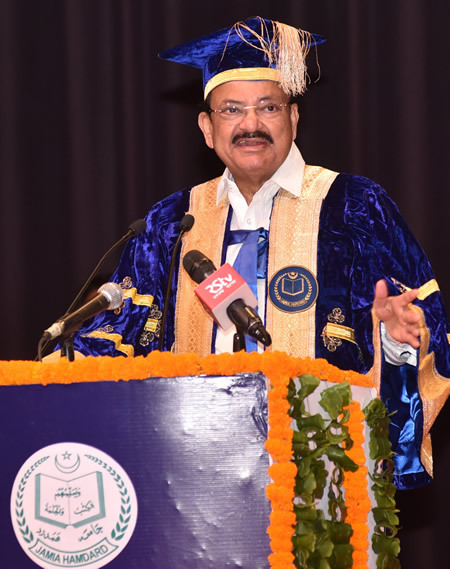 October 22, 2018 — The Vice President of India, M. Venkaiah Naidu, today exhorted universities and higher educational institutions in the private sector to earmark a certain percentage of seats for the weaker sections and subsidize their education. Mr. Naidu was delivering the 9th Convocational Address of the Lovely Professional University at Phagwara, Punjab. The Vice President pointed out that the public sector alone cannot provide quality higher education for all and the private sector must pitch in. He said that industries and the private sector, in general, should supplement the efforts of the government in making quality education available to all. “Our challenge is to ensure the spread of knowledge to every section and every corner of our country,” he added. Calling for a complete overhaul of our education system, the Vice President said that majority of our colleges had become breeding centers for producing students with degree certificates rather than individuals with critical analytical skills. “In the 2019 Times Higher Education’s global rankings, no Indian University has figured in the top 200 institutions. These rankings underscore the need for higher education institutions to improve the standards by leaps and bounds to make them globally competitive,” Mr. Naidu stated. “Dear graduating students, today is an occasion to remember fondly for the rest of your lives. 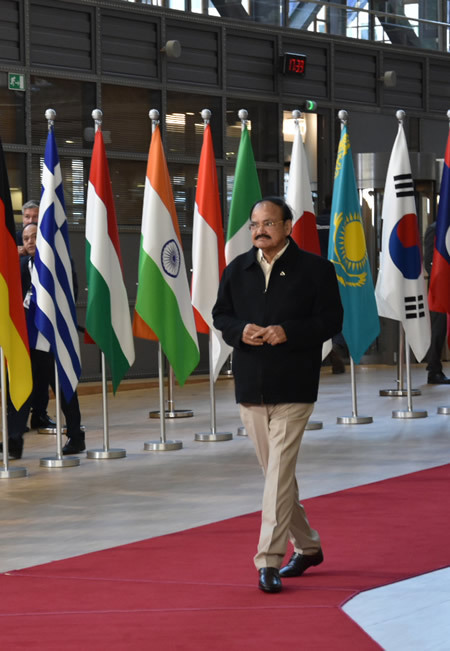 Strive to become independent thinkers and use your knowledge and competencies for the betterment of society for building a strong, modern and prosperous India,” Mr. Naidu said. “I am quite happy to be in this beautiful and imposing campus of Lovely Professional University to participate in its Convocation. I want to congratulate LPU, a young university, for its enthusiasm to provide quality education and prepare students to face the challenges of the global society in the 21st century,” the Vice President concluded. 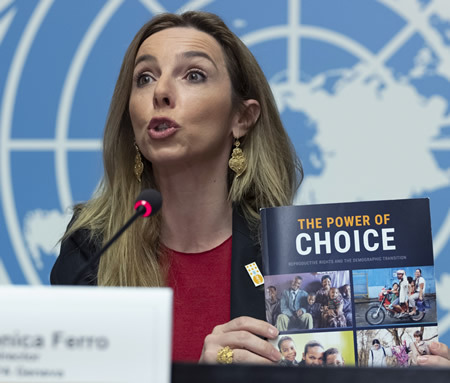 Photo: Monica Ferro, Director of the UN Population Fund (UNFPA) Office at Geneva, briefs press on the report on the State of World Population in 2018. 17 October 2018. Geneva, Switzerland. UN Photo/Jean-Marc Ferré. Photo: Piyush Goyal, Minister of Railways & Coal, Government of India. 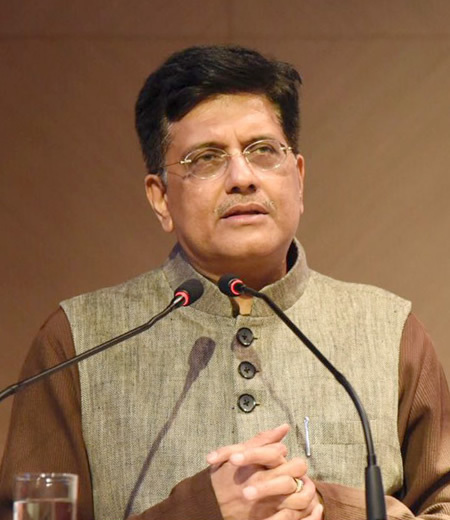 PHILADELPHIA, October 19, 2018 — The Kleinman Center for Energy Policy at the University of Pennsylvania School of Design has awarded its fourth annual Carnot Prize to Piyush Goyal, Minister of Railways & Coal and former Minister of Power, Coal, New & Renewable Energy and Mines, Government of India. The award recognizes the pathbreaking transformations in India’s energy sector under the leadership of Prime Minister Narendra Modi. The Carnot Prize is the Kleinman Center’s annual recognition of distinguished contributions to energy policy through scholarship or practice. The most prestigious award in the energy sector, Carnot Prize is named after French physicist Nicolas Sadi Carnot who recognized that the power of the steam engine would “produce a great revolution” in human development. The Carnot Prize is intended to honor those leading revolutions in energy policy to further progress and prosperity. “We applaud the Honorable Minister Goyal for his courageous work in crafting policy capable of meeting the biggest challenges in energy,” said Frederick Steiner, dean and Paley Professor at PennDesign. “It is a testament to the visionary leadership of Prime Minister Narendra Modi that this work energizing the lives of 1.3 billion Indians is being globally recognized with the Carnot Prize by the University of Pennsylvania,” said Goyal. The Kleinman Center for Energy Policy operates within the School of Design at the University of Pennsylvania. Its mission is to create the conditions for policy innovation that support a just and efficient transition to sustainable energy. The University of Pennsylvania is an Ivy League school. Sources: University of Pennsylvania School of Design and Ministry of Railways, Government of India. Photo: The Open Hand Monument, designed by Le Corbusier, is a symbolic structure located at Capitol Complex, Chandigarh, India. 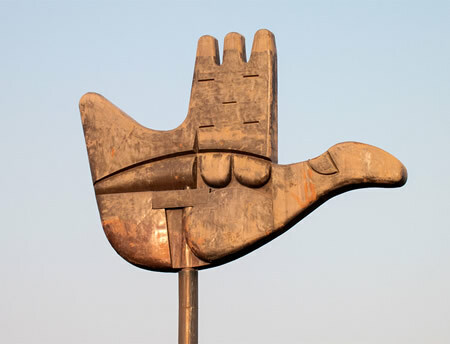 It is the emblem of the Chandigarh Administration and symbolizes “the hand to give and the hand to take; peace and prosperity, and the unity of mankind.” Image Credit & Copyright © Fernando Stankuns. Photo: The Governor of Punjab & the Administrator of Chandigarh, V.P. 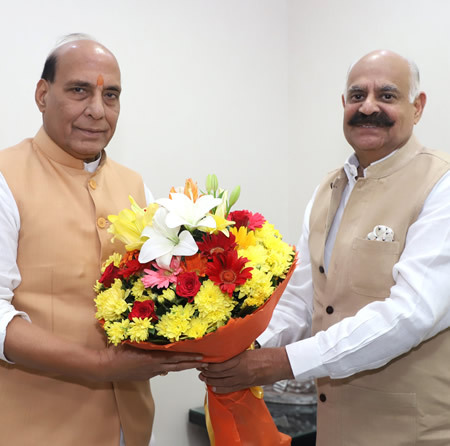 Singh Badnore, calls on the Union Home Minister, Rajnath Singh, in New Delhi, on October 14, 2018. • The Ministry of Home Affairs has advised the UT/Chandigarh administration to make it optional for Sikh women to wear protective headgear when riding a two-wheeler or sitting on its pillion, as per the existing practice in Delhi. • The Ministry of Home Affairs has advised the UT/ Chandigarh administration that in filling up civil posts, the ratio of 60:40 may be used as between Punjab and Haryana, wherever the administration is following it conventionally. • Till further orders, the Ministry of Home Affairs is keeping in abeyance, its notification dated 25.09.2018, merging the posts of DSPs (Deputy Superintendents of Police) of Chandigarh Police with DANIPS. Chandigarh is a city and a union territory in India that serves as the capital of the two neighboring states of Haryana and Punjab. It is not a part of either of the two. It is governed directly by the Union Government in New Delhi. It is one of the early planned cities in post-independent India and is known for its architecture and urban design. Swiss-French architect Le Corbusier prepared the master plan of the town. Source: Ministry of Home Affairs, Government of India. The Oyster Perpetual Yacht-Master II is a unique regatta chronograph dedicated to both yachting enthusiasts and experienced sailors. 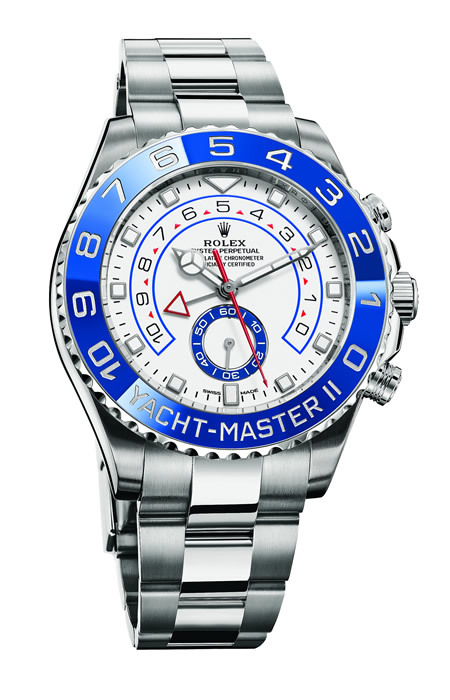 Created in 2007, the Yacht-Master II features an exclusive function developed by Rolex, a programmable countdown with a mechanical memory. A service that responds ideally to the need for precise timing during the crucial starting sequence of a regatta. As in any contest of speed, precision is of the essence in a regatta. 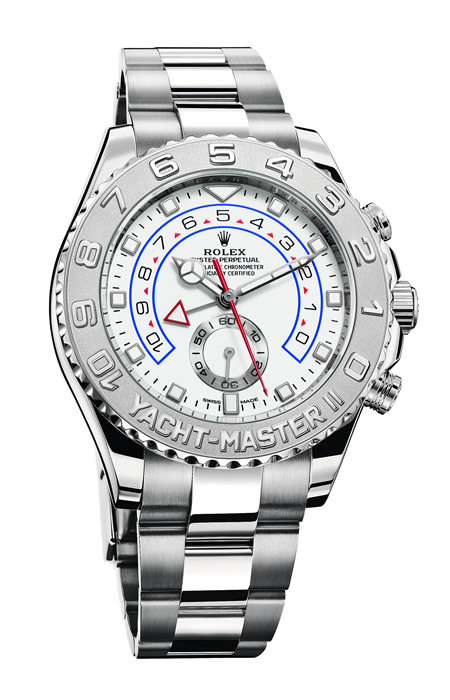 The Yacht-Master II features an original mechanical function: a countdown that can be programmed from 10 to 1 minutes and allows skippers to precisely time and follow each race’s specific formal starting procedure. LONDON, October 15, 2018 — QS Quacquarelli Symonds, the global higher education think tank responsible for the world’s most-consulted world university rankings, released their first standalone ranking of India’s higher education institutions. The inaugural edition of the QS India University Rankings is designed to offer an independent analysis of the performance of Indian institutions. The rankings include Public Universities, Private Universities, and H.E. Institutions or Deemed Universities. IIT Bombay is named India’s leading institution. IITs take up seven of the top-10 places. IIS Bangalore takes the second spot. Twenty Indian institutions receive full marks in the Staff with Ph.D., the indicator designed to identify the extent to which institutions are cultivating a highly-qualified faculty body. In the research productivity indicator, nine institutions achieve a score between 98.4 and 100. IIT Bombay, Madras, Delhi, Kharagpur, Kanpur and the University of Delhi enjoy outstanding regard among the nearly 43,000 international employers surveyed, while IIT Bombay, IIT Delhi, and the IIS Bangalore were the most voted by 83,000+ international academics polled. On a metric-by-metric basis, other institutions also stand out such as the Institute of Chemical Technology, Mumbai, which achieves the highest score of the QS’s indicator of research impact, adjusted for faculty size. Institutions have been scored on academic reputation (30 per cent), employer reputation (20 per cent), faculty-student ratio (20 per cent), proportion of staff with PhD (10 per cent), papers per faculty from Scopus database (10 per cent), citations per paper from Scopus database (5 per cent), proportion of international students (2.5 per cent) and proportion of international faculty (2.5 per cent). Photo: Alternative film Gold Medal winner Shae Demandt of Florida State University prior to the 45th Annual Student Academy Awards on Thursday, October 11, in Beverly Hills. Image provided by & Copyright © Richard Harbaugh / Academy of Motion Picture Arts and Sciences. LOS ANGELES, CA - The Academy of Motion Picture Arts and Sciences honored its student winners from colleges and universities around the world at the 45th Student Academy Awards ceremony, held at the Samuel Goldwyn Theater in Beverly Hills on October 11, 2018. The Gold, Silver and Bronze Medal awards were announced and presented by documentarian Arthur Dong, actor and comedian Kumail Nanjiani and directors Catherine Hardwicke and Patricia Riggen. Gold: Pierre Perveyrie, Maximilien Bougeois, Marine Goalard, Irina Nguyen-Duc and Quentin Dubois, “The Green Bird,” MOPA (Motion Pictures in Arles) France. Gold: Mart Bira, “Nomadic Doctor,” University of Hertfordshire, United Kingdom. Gold: Jonatan Etzler, “Get Ready with Me,” Stockholm Academy of the Arts, Sweden. Silver: Lisa Gertsch, “Almost Everything,” Zurich University of the Arts, Switzerland. Bronze: István Kovács, “A Siege,” University of Theatre and Film Arts, Budapest, Hungary. Source: Academy of Motion Picture Arts and Sciences. Photo: A conference officer in the UN General Assembly distributes ballots before the elections of the UN Human Rights Council. The United Nations General Assembly today elected eighteen new members of the Human Rights Council for three-year terms beginning on 1 January 2019. Those chosen were: Argentina, Austria, Bahamas, Bahrain, Bangladesh, Bulgaria, Burkina Faso, Cameroon, Czech Republic, Denmark, Eritrea, Fiji, India, Italy, Philippines, Somalia, Togo, Uruguay. 12 October 2018. United Nations, New York. UN Photo/Manuel Elias.